We recently received three guest blog entries regarding the use of Multiple Intelligences Theory in music education. The first, about MI and songwriting, is available by clicking here. In the second blog, printed below, Graeme Winder, an advocate for music education reform for over 17 years, outlines how a multiple intelligences perspective can increase engagement and student success. Winder, who draws from a mix of personal experience as well as classroom studies, seeks to forge powerful new ideas into traditional paradigms in hopes of creating a much more effective way to teach music. Click here to read the subsequent third post in the series about Edgar Willems' teaching system, MI, and music education. Can Multiple Intelligences Theory Save Music Education? Does this sound familiar? You, your child, or someone you know, enrolls into music lessons with the hopes of reaping all the cognitive benefits that music education has to offer. Before long, what started out as unabashed excitement to begin this new journey of musical exploration, quickly degrades into a frustrating path of learning how to convert pages full of little black dots into music on your instrument. The vast majority of those taking this path end up quitting soon after. In fact, music learning across the board, both privately and in our school systems, suffers from an astonishingly high drop-out rate of almost 80 percent in the first three years in my experience. Given the enormous cognitive, social, and artistic advantages that music learners have over non-music learners, why wouldn’t more individuals persevere through the initial struggles in order to reap the rewards that are promised to come? Research studies have shown that lack of interest, poor relationships with the instructors, scheduling, and budget concerns all play a role in student dropouts. And while all of these reasons are valid, what if the real issue was something much deeper, something at the core of the teaching itself? What if the learning process was too restricted by antiquated paradigms to motivate and inspire the learning diversity of today’s student? Many aspects of music have evolved throughout the centuries. New styles, instruments, and digital music breakthroughs continue to excite us today. And yet, the core of how music elements are taught has not shifted far from its pre-Renaissance western origins. As more and more students continue to fall out of the traditional teaching, the desire for alternative options continues to grow. For the past seven years, our incubator school, Winder Academy of Music, has been researching, testing, and developing a new approach to solving these pedagogical challenges head on. Our approach was simple: design a new system that allowed for multiple learning pathways using a creative-based foundation. We began by dividing our lesson plans into nine musical sub-categories that formed the core of our multiple intelligence platform (See Table 1 below). We then tested our students using carefully crafted evaluation techniques that allowed us to define and isolate a particular strength or weakness in each of the nine areas, resulting in a jagged-line profile of the student. Once we had this information, we could then mold a personalized lesson plan centered around the highest scoring areas while creating a secondary plan that would work on bolstering the students’ weaker areas. For example, let's say a student shows a particularly strong affinity towards the following fields: fine motor skills (kinesthetic), music theory and analysis (logical-mathematical), and lyricism (verbal-linguistic) . This student would then have a lesson plan that would include a stronger focus on technically challenging pieces and song-writing, highlighting those strengths in the very first lesson. In seven years, Winder Academy has reported a retention rate of almost 75% and has found great success in the new method. The identification and development of individual learning strengths had clearly led to much higher levels of both effectiveness and enjoyment. Students trained in this method are demonstrating a very advanced level of musical competency in many different areas. From playing anything by ear, to sight reading advanced sheet music, to writing original compositions, we have seen that the students advance much more quickly and with greater enthusiasm when they are learning in a style that aligns with their particular intelligence strength. While there is still much more to be explored, tested, and understood, it is clear that offering multiple intelligence learning pathways to achieve stronger musical connections has had a profound impact on the direct success and retention in our school. Music touches every person on this planet in such powerful ways. 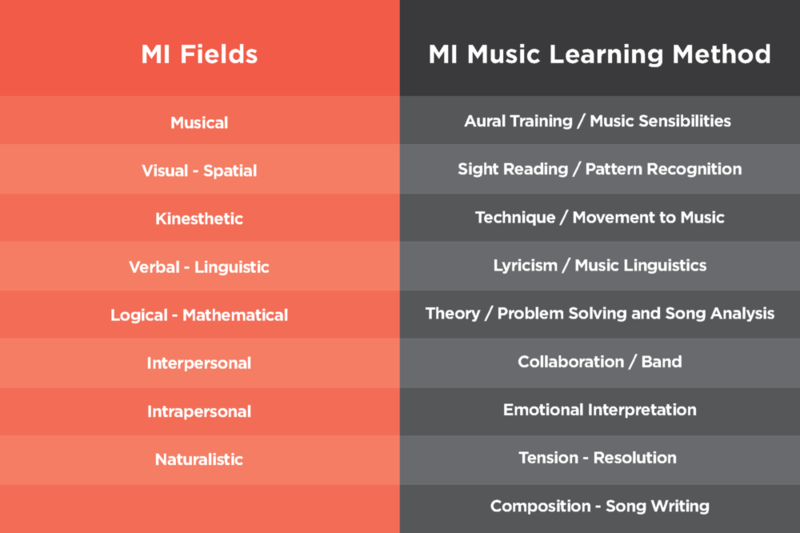 Perhaps with the help of MI learning, the questions and challenges facing music education today can finally be answered.